I have a feeling you can image what it was like when Jennifer Grey, from The Old Painted Cottage, told me I was going to be her “Cottage of the Month” house for January 2014. I am thrilled beyond belief to be added to her list. What better way to start off the new year? I have a feeling it’s going to be a good one! Great photos of your lovely home, Denise! All the best in 2014. I think I have fallen in love. Racing heartbeat, sweaty palms…the whole bit. If only….I would. 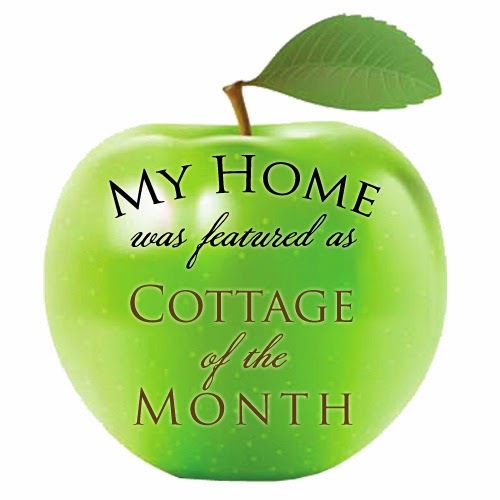 Congratulations on being featured at Cottage of the Month, your home is wonderful, I love your cozy family room and dining room and the lake cabin bedroom! You are a very creative woman! I loved seeing your house at Cottage of the Month. I am a color girl and I just love your use of color. Your home is beautiful, Denise. Such a pleasure to see it featured at Cottage of the Month. Love you style. Congratulations.